The very name “Thanedar” invokes interest when you talk of it in reference to a place. Yes, you read that right. There is a hill station in Himachal Pradesh by the name of Thanedar. 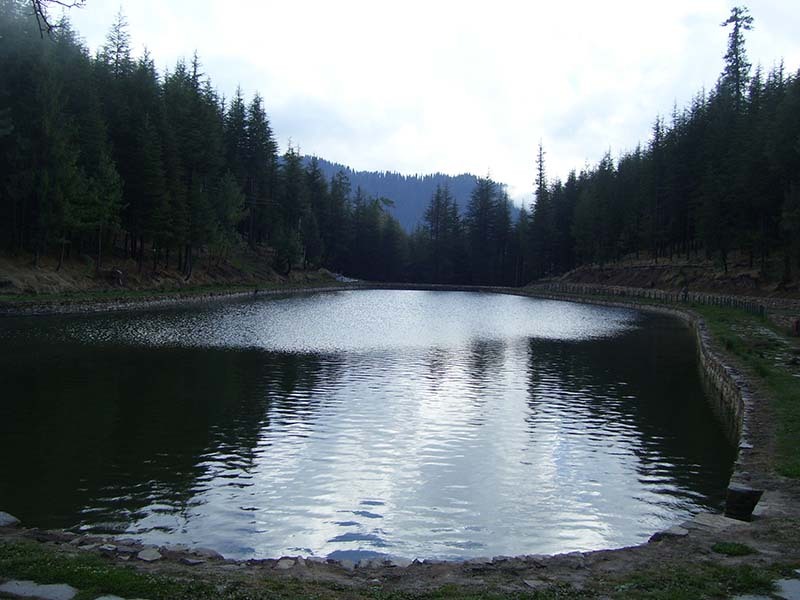 It is about 3 hours’ drive from Shimla and about 20 minutes from Narkanda; but not many people would have heard of it. It is possibly a name that is known only to people who like to visit offbeat destinations more than the regular tourist spots. Even I knew of this place from a few friends but never seriously thought of visiting myself until I landed here quite by chance. I was on my way to Rohru after spending a night in Narkanda when a friend suggested covering Thanedar on the way. I agreed for a short trip but fell so much in love with the place that I returned a few weeks later to spend a couple of days in Thanedar only. For a brief introduction, Thanedar is a small village in the state of Himachal Pradesh. It is located at a distance of about 80 kilometers from the capital city of Shimla. At an altitude of 8,000 feet (2,400 meters, which is slightly higher than Shimla), this tiny hamlet is famous for being home to one of the first apple plantations in the country. The area around Thanedar is also the orchard region of Himachal Pradesh, where cherries, strawberries, and apples are found in quite a large number. In short, it is a perfect place to spend some time away from the crowd and in complete peace. How you can plan a trip to Thanedar is what I will be talking about in this article. Let me begin this by first mentioning why would want to visit Thanedar in the first place. To be honest, if destinations like Shimla and Manali are your thing, than Thanedar is not the place for you. There is nothing out here except for a few houses, orchards with mighty Himalayan peaks all around. It is just a tiny village hidden up in the hills. If you like your vacations to involve a lot of sightseeing, fun activities, eating out, and plenty of shopping then you will not like Thanedar. However, if you are looking forward to spending some time at a place that is far away from the tourist mania and never gets crowded then you should be headed to Thanedar. If discovering unexplored and offbeat destination is your idea of a trip than you would love it here. Thanedar is located near the small town of Narkanda in Himachal. 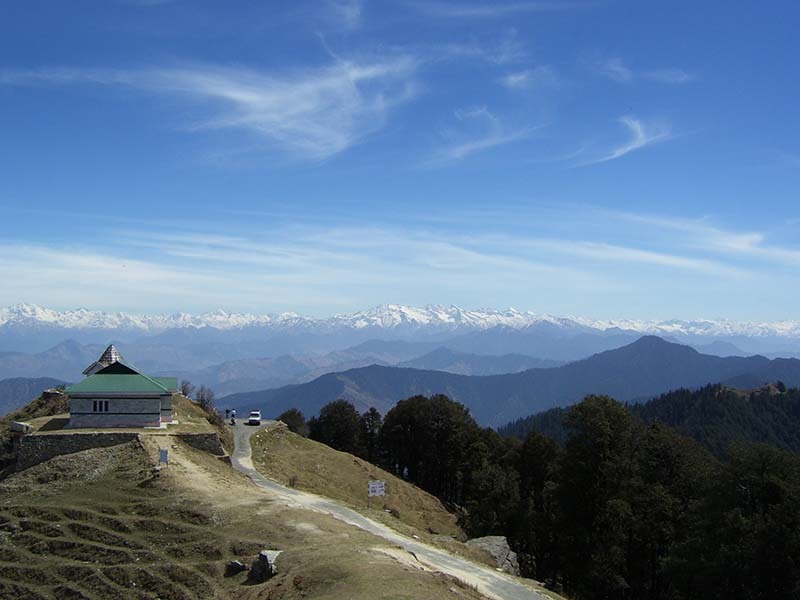 It is located at a distance of 445 kilometers from Delhi, 80 kilometers from Shimla and about 15 kilometers from Narkanda. I mentioned Narkanda here as a reference to the location because that is the nearest town which is also a well-known tourist spot. Yes, Thanedar is a very safe place to visit. You won’t find many tourists around but the local villagers are very simple and warm people. With that being said, you must yourself be careful and sensible to not do anything that may risk your own safety. Common sense is always important to keep oneself out of trouble. Another thought that may come to mind is of rains; is Thanedar safe in monsoon? You will really have to keep a check on the weather in that regard. The region receives a lot of rain each year, enough to cause landslides and block roads. So if your trip was planned in July or August, please check the weather forecast before you leave home. 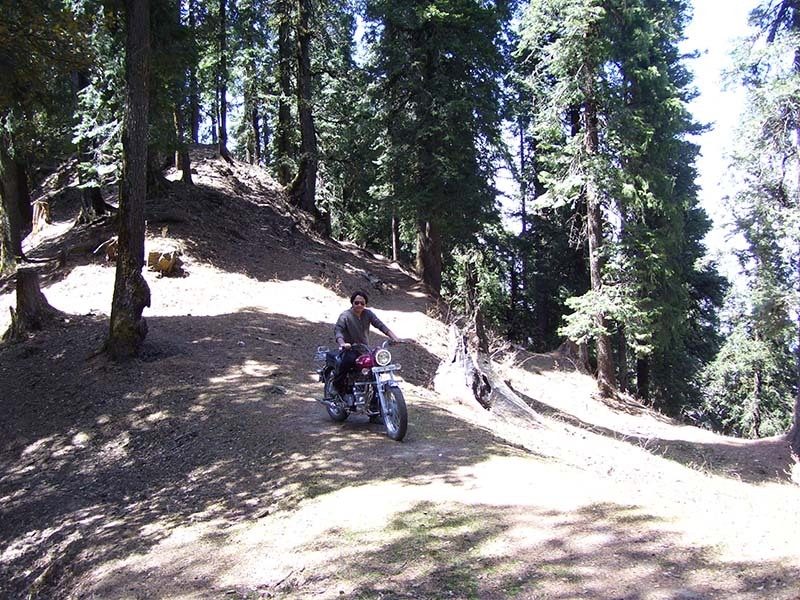 Due to its location in the hills, a journey to Thanedar is possibly only by road. You can either drive all the way from your home by your own vehicle; or arrive at the nearest airport or train station and reach Thanedar from there. You can rent a private taxi for the trip from Shimla; but even if you were traveling by public transport, you can easily reach Thanedar without any problem at all. For the sake of this article, I will explain the route starting from Delhi. However, even if you were coming from a different city, reading through the information below will still give you an idea on how to reach Thanedar. Starting from Delhi, the route for the journey will be as mentioned below. Assuming that you started your journey from Delhi; you will first drive on Delhi – Chandigarh highway all the way till Ambala. After Ambala and just before Chandigarh, you will then turn on the Himalayan Expressway and then continue towards Shimla. There has been some road widening work happening on this stretch in the last couple of years so you may run into a bit of congestion on the road. As you get closer to Shimla, chances are that you will get stuck in the traffic and a long line of cars here. Be patient, cross the crowded town and continue towards Narkanda. The entire journey from Delhi to Narkanda will take about 9 – 10 hours depending upon your speed and breaks. From Shimla, it takes about 2 hours to get to Narkanda. A road from Narkanda bifurcates towards Rohru and this is the one you will have to turn on. Do not continue on the same road that you traveled on from Shimla because that will take you to Rampur. Ask around in Narkanda and someone will point you in the right direction. This is the same road that also goes towards Hatu Peak as well. Turn on this road, continue driving and you will reach Thanedar after about 15 kilometers. After you take this diversion from Narkanda, just keep driving straight and do not turn right towards Hatu or Rohru. Ask the locals if weren’t sure. If you were traveling by public transport, then there would be two major stops in between; the towns of Shimla and Narkanda. Both these places are very well connected and finding a bus for either of these would not be a problem at all. An ideal way to complete this journey would be to first look for a Bus for Shimla from your city. Shimla is one of the most visited hill stations of our country and buses to Shimla are common from almost every major city nearby. Once you have arrived in Shimla, you will then have to look for a Bus for Narkanda. Board any bus that is going towards Rampur, Reckong Peo, Sangla, Kaza, Pooh, Kalpa or Chitkul. All these buses would pass through Narkanda and you can get down at your stop. Or just ask around at the Bus stand and anyone can point you in the direction of a Narkanda bound bus. These travel on a regular basis throughout the day. After reaching Narkanda, you will either have to rent a private taxi or look around for a shared one or hitchhike to Thanedar. Finding a Bus for Thanedar would be very rare so do not rely on it. Just look for a private or shared cab and be on your way. A private taxi that can drop you at Thanedar from Shimla will cost a few hundred bucks. If you rent a taxi all the way from Shimla then it will cost around Rs. 2,000. From Chandigarh, it will cost between Rs. 5000 to Rs. 6000. The nearest airport to Thanedar is the Shimla airport located in Jubbarhatti. This, however, is a small airport and flights are limited. The nearest major airport is at Chandigarh which is connected with several flights from all over the country. Chandigarh to Thanedar is a total of about 190 kilometers for which you can either rent a private taxi; or board a Bus for either Shimla or Narkanda. The nearest railway station is at Kalka, about 140 kilometers away from Thanedar. The famous Kalka – Shimla toy train plies on this route daily and the fare is also not that high. It actually is a great way to plan this trip. You can first arrive at Kalka by either a flight or train and then board the toy train from there till Shimla. Depending on when you reach Shimla, you can either look for a means of public transport to Thanedar the same day; or stay in Shimla for the night and then travel to Thanedar the next day. After Kalka, the next and major railway station is at Chandigarh; which is very well connected by trains from all over the country. For someone traveling from Delhi, if you went by your own vehicle then you can drive all the way till Thanedar as per the route I explained above. If you were traveling by public then best would be to go to ISBT and look for a bus for Narkanda direct. There is one available on a daily basis but its frequency is not great. If you were able to board the Narkanda bus then it will make the journey a little easier. If not, then the best would be to first board a bus for Shimla from Delhi. At Shimla, you will changes buses for Narkanda and then finally reach Thanedar by taxi. All the above-mentioned mode of commutes remain available in the winter season as well. The only exception would be if the road temporarily got blocked anywhere. In that case, you will not be able to reach Thanedar by either your own vehicle or public transport. Weather in Thanedar will entirely depend on what time of the year you arrived here in but it is mostly pleasant owing to the high altitude. It snows here in the month of January and February and sometimes enough to block the roads as well. Spring arrives in the month of April and for the next three months, weather mostly remains pleasant with clear skies. It starts to rain here towards the end of July and Monsoon prevails in the months of both July and August. It rains quite heavily around this time and landslides too are common. Weather again turns pleasant in September and is one of the ideal times to be here. Come October, whatever was green changes into Orange as this now is the time of Autumn. Cold too starts to settle in October and by November, it is winter once again. I have actually covered the topic of weather in Thanedar in a different article. Please read Monthly Breakdown of Weather in Narkanda. This article talks about Narkanda but since it is only 15 kilometers from Thanedar, the same information will apply for both the places. The temperature of Thanedar mostly remains on the cold side throughout the year. During peak summer, it rises to a maximum of 30 Degrees Celsius and then drops back down to an average of 5 Degrees in winter. At nights in the months of January and February, it can drop down to even 0 or below. When to visit Thanedar will entirely depend on your reason to visit. If you want to see snow then the months of January and February will be the best. If you want to see lush green valleys all around then visiting during or right after Monsoon will be a good time. October is the best month to witness the magic that autumn brings; turning the threes to a golden orange. From an overall point of view though, the months of April, May, June, and September are considered to be the best time to visit Thanedar. The temperature at this time is moderate throughout the day and the weather is pleasant. The months of July and August are generally considered to be bad because of the monsoon season. It rains here quite a lot and sometimes enough to even cause landslides, or to keep you indoors throughout the duration of your trip. But if you are ready to take the risk though, you will be presented with amazing scenery all around with plenty of greenery and flowers of numerous kinds blooming in the valley. November is a bad month to come this way because the vistas get dull and boring; the weather turns very cold and there isn’t even any snow around. If you were visiting with family, I will suggest that you plan between April to June. For Photography, September and October will be best. What clothes to pack for the trip will entirely depend on the time of your trip. For months of April, May, June, and September, all that you need are your regular cotton clothes, some light woolens, and a light jacket. For a trip in July and August, bring clothes that can dry fast; like Polyester. From the months of October till March, you must bring in some heavy woolens accompanied with a windproof jacket. Make sure your jacket also has a hood to protect your head and face. If not, then you must bring a cap and muffler as well. For a trip in January and February, pack shoes that can survive walking in snow. Your shoes should have a good grip otherwise you will just be slipping and falling everywhere. Trekking shoes(recommended for trek) or Shoes with good grip. Thanedar is just a small village and there are no tourist attractions here as such. The only thing that you come to Thanedar for is the natural beauty of the place. Sitting in the lap of the hills of Himalayas, in a dense forest with Apple Orchards all around, it truly feels like a paradise. The peace and tranquility of the place will leave you charmed. With that being said, there are a few attractions near Thanedar that are definitely worth a visit. Mostly all of them are within a short distance and can easily be covered within a day. Below is a list of the top tourist places in Thanedar. I have actually covered this topic and explained all these places in detail in another article. To know where these places are exactly located and how you can visit them, please read Tourist Attractions in and around Narkanda. Apart from visiting all of the above-listed places, some of the other things you can do in Thanedar are photography, walk across the village, bird watching, trekking, picking up apples and apricots (with permission of the owner of the orchard of course) and skiing if you arrived in winter. Stargazing and Night sky photography is another activity you can enjoy if photography is your thing. Or just take a walk around the apple cultivation belt to absorb the panoramic vistas of the lush green valleys and mountains that this place upholds. But most of all, relaxing, spending some time in peace and enjoying the scenic beauty of the place is what you should be visiting Thanedar for. The thing with hotels in Thanedar is that they are all a little on the costlier side. When I say costly, I am talking about Rs. 3000 – Rs. 4000 for a room. If budget is not a problem, then mentioned below are a few good hotels that you can stay at. Of all of the above, Banjara Orchard Retreat is located right in the heart of Thanedar and is the most well known. Their rooms are great, clean and the staff is friendly. Food too is good at this hotel but they charge about Rs. 3500 for a normal room and about Rs. 7000 for a wooden cottaage. Keep in mind though that there is no TV in their rooms which can be a problem for some people. The overall location of the hotel is quite scenic and they have a Bonfire every night that you can sit around. If you do not like spending so much on fancy hotels then the PWD rest house in Thanedar is your best bet. The rooms are clean, spacious but they have no provision for food. You will have to manage that on your own. This is a great option for someone traveling on a budget. Another thing to keep in mind is that you will not get accommodation here unless you booked in advance. To know how you can do so, please read How to Book a room in HPPWD Rest House. Apart from the rest house, there are no other budget stays at Thanedar. The next set of hotels will be available at Narkanda, about 15 kilometers away. There are no campsites available in Thanedar. To be honest, I did not see any locations good enough to pitch your own tent. The place is surrounded by dense forest and I wouldn’t recommend camping here. If you, however, want to go camping then do not do so in the middle of nowhere. Talk to a villager, pay a little money and ask them to give you a safe spot for camping. There are no Banks or ATMs in Thanedar. The closest one is located in Narkanda. There are branches of Uco Bank, SBI, and HP State Co-operative bank in Narkanda and they all have their own ATMs as well. This too will be available only at Narkanda. There is a petrol pump where you can buy fuel from in Narkanda. Mechanics too are available in plenty. In fact, there are authorized service stations of some car and motorcycle companies here. If however it was a major breakdown, then you may have to bring your car back to Shimla. Medical facility for small ailments and a dispensary is available at Narkanda. For anything serious however, you will have to go to Shimla. I would strongly suggest that you bring some basic medicines along; like for cold, fever, flu, stomach ache, headache etc. All cellular companies have coverage in Thanedar. No matter which network you are on, your phone will be working fine here. Reception will be strong and voice clarity satisfactory. Data connectivity too will be good. There is electricity available in the village and at all hotels. Every basic facility that you will need as a tourist will be provided. The only thing that is amiss here in the hotels is a TV. I know this for sure about Banjara and HPPWD Rest House; not sure about the others though. The condition of the roads will remain good throughout the journey. The final stretch between Narkanda and Thanedar for 15 kilometers gets a little narrow and bad; but for the rest of the way, it is a comfortable ride on a smooth road. There is no best vehicle as such for visiting Thanedar. You can bring any car or motorcycle as long as it is well maintained. Locals here drive around in a Maruti Alto without any problem at all. Even in terms of a motorcycle, a 125CC bike too can easily travel to Thanedar. Locals here communicate in both Himachali and Hindi but the ones related to tourism business like hotels or taxis can speak a little bit of English as well. Resorts and Hotels at Thanedar have their own restaurants that serve almost all north & south Indian dishes. They usually also have Chinese and continental food on their menu. Since Thanedar is just a small village, eating outside the hotels at some local dhaba is not really that big a choice. There is no such special food that you would want to try here. However, the local wine of this region prepared from apples, rhododendrons, and peach is good. Since the entire town is known as the fruit bowl of India, enjoying fresh apples from the trees would be the most joyful experience. Apple is the key highlight of Thanedar and you can shop for the locally prepared apple products like wine, jams, pickles, juice and dried apple sweets. There are some handicrafts too on sale but they are brought in from Shimla and sold at a higher rate here. If you want to buy handicraft, I would recommend doing that in Shimla on your way back. Yes, it snows in Thanedar in the months of January and February. Thanedar is the amalgamation of ‘thandi’ and ‘dhar’, which translates to ‘cool mountain’. The life and story of Samuel Stokes is related to this place. He was an American who settled in India and participated in the Indian Independence Movement. Later he converted to Hinduism and changed his name to Satyananda Stokes. His wife, Agnes Stokes, too converted and changed her name to Priyadevi Stokes. He is best remembered today for having introduced apple cultivation to the Indian state of Himachal Pradesh which actually is slightly incorrect. Apple cultivation was already happening in the region. Samuel only identified a new strain of apples developed by the Stark brothers of Louisiana as being suitable to the Shimla Hills and began cultivating them on his farm. You can read more about his life at the Wiki Page, Satyananda Stokes. A minimum of 4 days is what I will recommend for visiting Thanedar. You can visit here over a weekend or in 3 days as well; but for it to be a truly relaxing and enjoyable trip, you must have at least 4 days in hand. You can arrive in Thanedar on Day 1, spend time sightseeing on Day 2 and 3 and return on Day 4. More details are provided in the itinerary below. For the sake of the itinerary, I will assume Delhi as your starting point. If you were coming from a different city, only the journey on 1st and last day will be different. Rest of the details will still apply. Your drive on Day 1 is pretty much a straight and comfortable one but will easily take at least 9 to 10 hours; so an early start from Delhi is recommended. If possible do call your hotel in Thanedar in advance and book your stay to avoid last any last minute hassle. There is some road widening work happening between Chandigarh and Shimla so traffic could be a little slow there. Total distance traveled will be about 420 kilometers depending on where you started from in Delhi. On Day 2 and 3, just relax and take life slow for a while. Visit all the places I listed above and walk around in the village. A drive to Hatu Peak is highly recommended and if possible, be there in time to catch either a sunrise or sunset. You can also visit the nearby town of Sarahan which is also a great tourist attraction. To read more, please take a look at How to Plan a Trip to Sarahan. After spending 2 days, you will return to Delhi either by the same route; or you can also take the diversion via Chail. And that covers almost all that you need to know about visiting Thanedar. The place is tiny in size but a giant in scenic beauty and a visit here is highly recommended. I hope the information above was of help. If you have any questions; or need any further details; please feel free to ask in the comments section below; or at our Community Forum; and I will be glad to answer. Can visit there via Kinnaur Spiti route from either Shimla or Chandigarh? Yes you can. From Shimla you can go to Thanedar and then continue to Kinnaur.